Surprisingly, the last vehicle iconic actor Steve McQueen owned and rode in was a pickup truck - and a beauty at that. It's now going to the auction block. Mecum Auctions will be auctioning the legendary actor's last known personal vehicle at the upcoming Mecum Celebrity Auction in Santa Monica, California on July 26-27. McQueen was an avid collector of motorcycles, cars, and trucks with more than sixty vehicles to his name throughout his life. 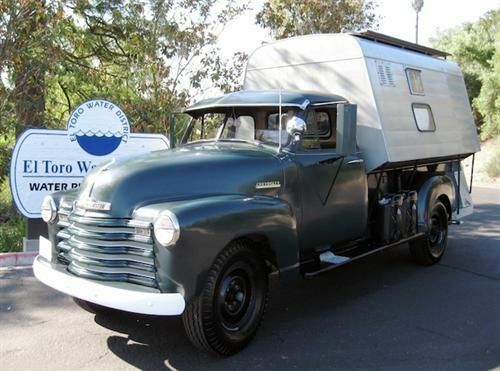 This 1952 Chevrolet 3800 series one-ton, long bed pickup truck in forest green and featuring a camper in the bed. The truck is far more important, though, as a historical piece because not only is it the last known personally-owned vehicle in McQueen's garage, but it's also the last one he ever rode in. In 1980, the truck was used to transport Steve McQueen from his home in Santa Paula to the Ventura County Airport where he would fly to El Paso, Texas and cross the border to Juarez, Mexico for his final cancer surgery. He rode in the camper with another celebrity, the Reverend Billy Graham, who says that while lying on the bed in the camper as they went to the airport, McQueen asked him about the afterlife and requested scripture readings and prayer. The Bible Graham handed to McQueen in that truck was in his hands when he died a few days later. McQueen first acquired the pickup truck in 1978 and kept it until he died. It was then auctioned with the rest of his estate in 1984. The truck has been kept in original condition (as McQueen had it) with the original paint, body and frame, engine, and toolboxes. The original mattress and license plates are also with the truck. The 1952 Chevrolet 3800 one-ton has a six-cylinder engine and four-speed transmission. One of the more fuel-efficient work trucks of the time, it sports tow five-gallon gas cans ("Jerry cans"), on the running boards, and other extras such as the driver's side spotlight, a sun visor, and an authentic, same year sport camper in the bed. The auctioned truck includes full provenance including all ownership transfers, registrations, etc.